From New York Times culture reporter Dave Itzkoff, the definitive biography of Robin Williams – a compelling portrait of one of America’s most beloved and misunderstood entertainers. From his rapid-fire stand-up comedy riffs to his breakout role in Mork & Mindy and his Academy Award-winning performance in Good Will Hunting, Robin Williams was a singularly innovative and beloved entertainer. He often came across as a man possessed, holding forth on culture and politics while mixing in personal revelations – all with mercurial, tongue-twisting intensity as he inhabited and shed one character after another with lightning speed. But as Dave Itzkoff shows in this revelatory biography, Williams’s comic brilliance masked a deep well of conflicting emotions and self-doubt, which he drew upon in his comedy and in celebrated films like Dead Poets Society; Good Morning, Vietnam; The Fisher King; Aladdin; and Mrs. Doubtfire, where he showcased his limitless gift for improvisation to bring to life a wide range of characters. And in Good Will Hunting he gave an intense and controlled performance that revealed the true range of his talent. Itzkoff also shows how Williams struggled mightily with addiction and depression – topics he discussed openly while performing and during interviews – and with a debilitating condition at the end of his life that affected him in ways his fans never knew. 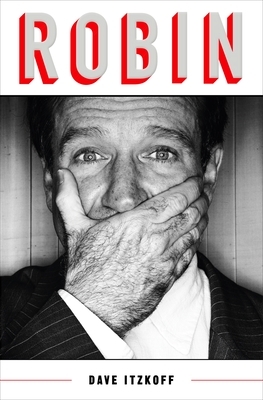 Drawing on more than a hundred original interviews with family, friends, and colleagues, as well as extensive archival research, Robin is a fresh and original look at a man whose work touched so many lives. Dave Itzkoff is the author of Mad as Hell, Cocaine’s Son, and Lads. He is a culture reporter at The New York Times, where he writes regularly about film, television, theater, music, and popular culture. He previously worked at Spin, Maxim, and Details, and his work has appeared in GQ, Vanity Fair, Wired, and other publications. He lives in New York City. “This is the complete portrait of Robin Williams, from the boyhood inception of his genius to the complexity of his death. Williams may well be one of those people who are impossible to fully understand, but this book is as close as anyone will ever come.”—Chuck Klosterman, author of But What If We’re Wrong?